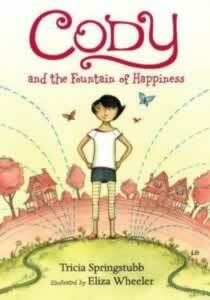 On a recent school visit, a student asked me why I began all the Cody books with “In this life…” followed by a list. I got the feeling he considered it a lazy move on my part, so I tried to explain how I wanted to link the books and give readers the feeling of returning to a familiar world, but also hint at the new developments and adventures to come. He seemed satisfied (or maybe he was just a very polite child). The full truth is, I began every book with “In this life…” for me as much as for my readers. Typing those words was like opening a door and joining a family reunion. Everyone was there—Cody, of course, but also her parents, Dad in his cowboy hat and Mom wearing yet another pair of new shoes, big brother Quiet Wyatt, best friend Spencer and his tai chi master grandmother, the unpredictable Meen kids, loyal Pearl and sweet, deaf old MewMew. With each reunion, I had the chance to hang out with them again and get to know them even better. Like family, they stayed the same–but not really. They revealed new quirks, opinions and secrets. Some of them I could relate to easily, others not so much (think Payton Underwood, aka P.U.). But these were my people, and I loved being among them. Plus, each time I said goodbye, I knew I’d get the chance to visit them again. Till this past April, when the final book in the series published. People are often curious about how a writer plans a series. 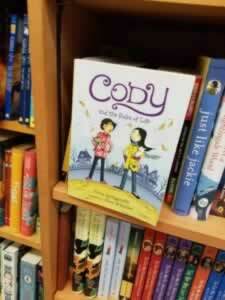 I was lucky in that, soon after signing up to write two Cody books, I got word that Candlewick wanted two more. 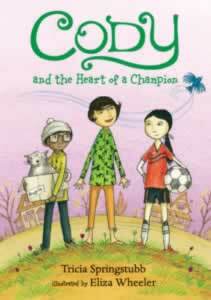 Book 1, Cody and the Fountain of Happiness, is set in the summer, so it felt natural and right to follow her and her friends through the school year and all four seasons, coming around to Book 4, Cody and the Heart of a Champion, set in springtime with another summer just around the corner. 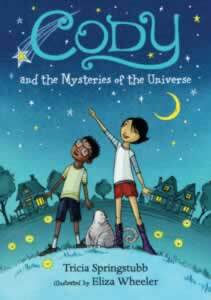 Cody’s friendship with Spencer, a friendship that thrives on how different they are as how much as it does on how much they share, has gone through its ups and downs and is about to enter a new phase. Cody’s discovered a lot about herself and her world. In this life, she won’t be good at everything she tries, but she’ll discover talents she didn’t know she had. She will make mistakes (some big), but with courage and help, she’ll figure out how to fix them. She’s developed a pesky thing called a conscience. She will never be patient, for better and for worse. Cody lives in a neighborhood like mine here in Cleveland–diverse, striving, bustling with activity. The other day when I was out for a walk, two little speed demons on bikes tore past me on the sidewalk, and I immediately thought, Maxi and Molly Meen. People were sitting on their porch swings, making me think, Spencer and GG. Book life and real life have merged, which is some comfort as I say goodbye to the first. Another comfort is seeing all four books together, like siblings or best-friends-forever. They look so cozy, supportive and happy. (It makes me feel bad for my stand-alone books, which by comparison look a bit lonesome.) I feel good about them being out in the big world together, even as, in my life, I’ll sorely miss the pleasure of writing them. This entry was posted in Uncategorized on December 6, 2018 by Tricia.